Come join us for a selection of excellent workshops to help build skills that you can bring back to your groups and communities. Our team has crafted together a series of workshops to provide the tools to better support one another in our communities. Starting in and running through the month of November, there are plenty of opportunities to come join us, but be sure to check them out soon as seats are filling up fast! Already taken PeerNetBc's trainings? Help spread the word to those who may benefit from these capacity-building opportunities: volunteers, program participants, program coordinators, youth workers, peer navigators, or even your roommate or neighbour! 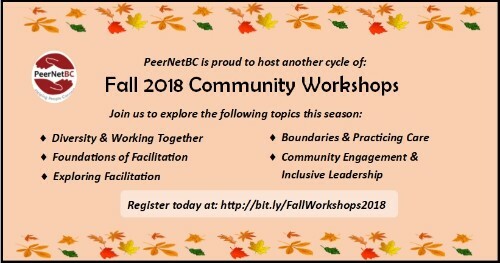 Taking place on the unceded territories of the Musqueam, Squamish and Tsleil-Waututh nations, PeerNetBC’s Community Workshops are provided twice per year. These workshops are open to everyone and offer a great opportunity to learn and network with people from various communities, groups, and organizations. Cost: $15 - $75+ sliding scale (including a $5 deposit), with no one turned away for lack of funds. Systemic imbalances of power exist in our society, and so recognizing how it influences the spaces we are a part of is an important skill for facilitators, group members, and community members at large. In this 6 hour workshop, through discussion and experiential learning, participants will explore our own roles and relationships with power and have an opportunity to broaden our perspectives on accessibility, allyship, inclusion, power, privilege, and how to work together equitably. Whether we are facilitating meetings, group discussions, or workshops, understanding our roles and responsibilities as facilitators is an essential component for creating engaging spaces for groups to work together. In this 6 hour workshop, participants will be introduced to the principles of peer support and explore their role in creating a foundation for more inclusive and cohesive peer-led groups. We will build on new and existing skills and tools necessary for effective facilitation and touch on different facilitation models. This workshop is designed for folks with little to no experience with facilitation, including folks seeking to brush up on their foundational skills. Prerequisite: “Foundations of Facilitation” and “Diversity & Working Together” or equivalent experience of facilitating groups. Building off of the concepts introduced in “Foundations of Facilitation”, this 6-hour workshop will delve deeper into specific skills and techniques that assist facilitators in effectively creating safer, more supportive, and productive peer-led groups. Participants will have opportunities to practice facilitating and navigating facilitation challenges, where we will explore group dynamics, create an understanding of the influences of power dynamics in a group, and share strategies and tools. Facilitating peer-led groups can be a very rewarding experience but it can also be very demanding. In order to avoid burnout and to make group facilitation sustainable, facilitators must have a clear understanding of personal boundaries and ways to practice care. In this 3 hour workshop, participants will explore concepts for understanding personal boundaries and self-care as well as collective-care within the context of a peer-led group. Participants will share and exchange tips and tools to help each other apply their learnings in real-life situations. Aimed at facilitators, this workshop is beneficial for anyone juggling multiple demands or providing active support in the lives of others. In this 6 hour workshop, we will explore, challenge, and redefine what leadership is and can be in our communities, and its relationship with advocacy and community engagement. Through unpacking existing frameworks of leadership, we'll build an analysis of who we identify as leaders; how we all can be leaders; and our possible roles and responsibilities. Participants will create a shared understanding of what community engagement could be like, and how it can be more inclusive, impactful, and sustainable. - Please inform us of any alternative ways to ensure your access needs are met! PeerNet BC has had a lot of shifts and changes over the last year. We're finally settling into a rhythm here and look forward to introducing our current team in the next newsletter. Stay tuned! PeerNetBC has been helping people connect since 1986, providing resources for peer groups and peer-led initiatives. Our resources and services are available for community members and groups across British Columbia, including online, rural, First Nations, multicultural and youth engagement initiatives. PeerNetBC is a non-profit, registered charitable organization.